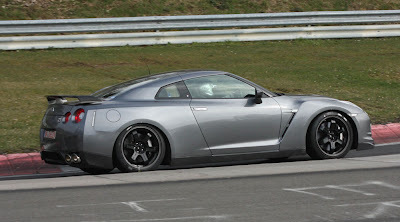 Head on over to Edmunds Inside Line to watch some video of the 2010 Nissan R35 GT-R Vspec at Nurburgring. I don't think you are going to see any real solid numbers on this car, until GM lays down the number with a ZR1. Once the ZR1 shows its hand, the Vspec will one up it at the track. Expect to see this. The ZR1, according to GM will be the fastest production car on any track, I think Nissan wants to check them on that statement. I think they have enough in reserve to easily do any number the ZR1 will do.